Do you remember my recent photograph of “In the Rain at Cattle Point Victoria B.C.“? Well, I have been musing about painting it. I don’t often do a study before tackling a larger painting but I was painting and repainting a particular idea over and over in my head so I knew there were painting challenges I was having trouble working out. So this morning, I decided to do this greeting card size palette knife study on a 5 x 7 inch gallery wrapped 1.5 deep canvas. One of my aims is always to let paint be paint when I am working on a canvas. Nothing helps with this more than a palette knife. I have the most gorgeous, small and springy knife that was a gift from my parents when I was fourteen years old. I have a newer one but it just doesn’t have the same flexibility and the same balance as my first. Kinda like a good saddle, once you find one that fits you and your horse, or this case me and my canvas, a person doesn’t desire another. I didn’t work out all of my painting challenges but I did find an answer to some and enough so to continue on to a larger canvas. And none of you caught me in my error yesterday but the Studio Spring Sale Event doesn’t end until tonight. Sorry about that. Me and dates often have a rather fluid relationship 🙂 I have it corrected now. SPROUT: What is your creative “study” practice in preparation for larger works? I like your creative challenge and the process of working through it. I love the roughness of this painting, along with its texture and surprises of color. I think it is in the detail, the items one does not see, or maybe humor in a collection of an old motel. Thanks Jeff and yes I can see how studying the details can bring about preparation for larger works. My most common study of details is noticing the light. Beautiful work! I love how expressive the brushstrokes are! I also love letting paint be paint and I applaud you for doing so because I can sense the choppiness of the water in your painting. Fantastic post and I look forward to more! Love the chunky feel of this Terrill. It is that all right Alison. Being so small it is part of what makes it like this. That little beauty is a real gem! I would imagine that painting on something small is even more difficult than on a larger scale. Well…I actually go at it a bit backwards. I start big — just blather the whole story and get it down on paper. I do a word count and whittle it down to half. Then I cut it in half yet one more time. The real challenge comes in not losing ANYthing with the economic use of words. “A small window to the sea…” I like that! Me too Laurie and I have this idea about picking up more 5 x7 inch or so canvas boards to paint more of these “small windows to the sea” so that they are easy to frame and ship and maybe will be a way for those who have less disposable income to enjoy a piece of original art. This is still a musing but what do you think? I think it’s a stellar idea! 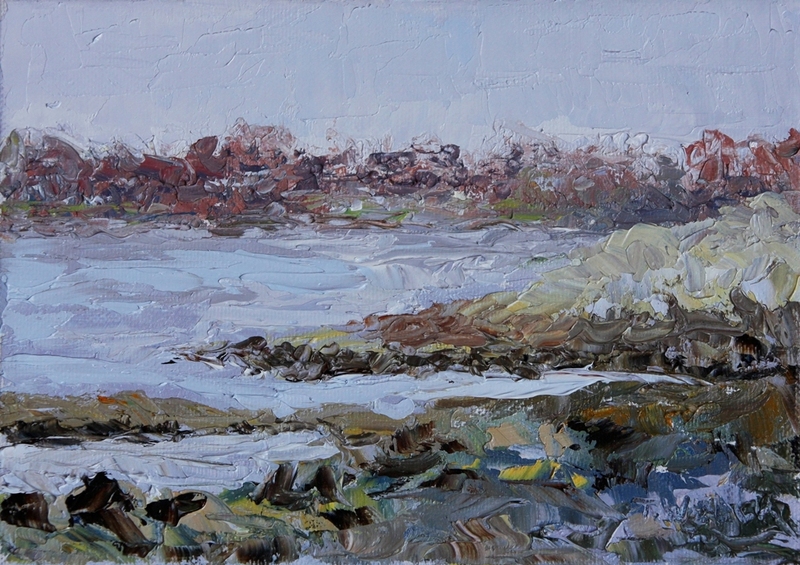 I like this work very much…and how it feels – If my aunt were still alive ( Victoria) I would send her right over – this would fit in with her other seascapes. I can’t seem to think of what to say for the sprout question. I am quite tired today…black sky and hail plus cleaning to get ready for weekend company – including a non-family guest…need to be on good behavior. Now I need to re-write the menu – someone allergic to seafood. Ah yes Patricia I can just imagine this wee painting in the company of other grand seascapes. She would smile and never notice that she was only a drop in a bucket. So glad you are enjoying it even in the odd shaped thumbnail. I have a daughter who is allergic to seafood and some fish – not a good one. The reaction is almost as bad as someone with peanut allergies. Oh and watch out for the Lea & Perrins or other Worchestershire sauce – they put anchovies in it. She used to get sick if my partner made the hamburgers for the BBQ but was fine is I mixed them. At first we thought she was being silly when she told us this but decided to look for closely to see if we did anything different. He put a little Lea & Perrins in his and I didn’t. Then we read the small print on the bottle and there was the offending fish. Thanks for the new information Terrill, We don’t use those products in our house because they contain wheat gluten…Have you tried Bragg’s Amino Acids? Just a suggestion – I use that instead of salt. The whole dinner just changed to oven fried chicken with wild rice, asparagus ( Mushrooms are out because of allergy) and strawberry shortcake with ice cream. I will have a baked sweet potato….there creative juices are flowing I sent a bit of chocolate to each person’s home – then I don’ t have to be confronted with that at my home. I like your idea of doing some more smaller prints…I think they would sell. My brother in law also makes note cards with his watercolors and does a huge business at a gallery in Birch Bay WA and Lyndon – I know you do some of that, but I just thought I would bring it up again! I haven’t tried Bragg’s Amino Acids Patricia. We use various sea salts in limited amounts most often after the cooking process. As we eat very little prepared foods this seems to work for us. I hope your dinner was a huge success and that you had the most wonderful visits with your company. Thank you for your encouragement to make the smaller paintings and prints. I talked with my physical venue last night and they are also keen about the idea. As of May I will be showing at the Greenhouse Restaurant solo – at least for awhile. This means for the summer I will need to come up with 16 – 18 new unique pieces each month to two months. A little scary but I am excited to try. We are also toying with the idea of me doing some Saturday onsite painting demonstrations. We shall see. If you did Terah you would leave an imprint like the kids in the wet cement and you fingers would be very colourful 🙂 Soon though it will dry and then it can be lightly touched with clean fingers. But it won’t dry all the way through for about a year. This is the nature of oil painting. Oh, yes, Terrill. I too often give a passing nod to dates. His reply, “January 1st.”–between laughter. I tried to explain that I meant the day of the week, but he has yet to hear my explaination. : ) You just gotta love him. I sometimes start with a piece of flash fiction (a story of less than 1, 000 words). Yes I can see how flash fiction may play the say role as a study in painting for a writer. And you and me and dates its a wonder we ever manage to meet for tea and a good visit! But we do so from time to time just the same. Another ravishing treasure that’s hard to take your eyes off. I love paintings that explore the elements perhaps better than any others. Ah, the sprout again makes me broach the preparation for testing students, which will lead to the final state-mandated exam in late May. I must apply myself to this soon. I get the sense that the same is true of photography for you Sam. I too am fond of being able to define a specific time of day and year in a painting. Good luck with getting those students prepared for their state-mandated exam. I sure they will do fine.